The track and the fans. It’s incredible how Formula One has grown in India, especially as cricket is such a big sport there. They are still massively into racing, we get a really big crowd of enthusiastic fans. It’s a cool place to go; the people are very welcoming and look after us really well. I’ve enjoyed it every time I have been. Physically it’s definitely a warm circuit, but not a killer compared to some. So with the track, you need a wide entry into 13, the last corner, to get a really good exit down the straight. Give it a bit of KERS close to the line and brake really late into turn 1. You carry a lot of speed through there and the car kind of slides a little bit. It’s important to keep the speed up and get a good exit out of turn 1, use the curb on the exit and then go straight into the left hander that goes uphill. You are trying to brake for turn 2 but you can’t see the Apex as you come uphill, it’s over a blind crest, so it’s tough to know where to brake and when to turn. It’s important to get a good time on the exit and not lose too much on the entry. The long straight is the most important one. You can break late and deep into turn 3 as it opens up so much on the way in, so it’s great for overtaking. You KERS on the turn 3 exit as it gets short and narrow, then go flat out turning into 4. You then lift and downshift, getting on the power for 5 and 6 which is a fast chicane. You go flat out through the entry of turn 6, lift, and flat out through 7 which is where it’s good to have a car that’s good with changing direction. Then you’re flat out to turn 8. You have that lift between 8 and 9, then a small lift through 9 as it’s a really long right hander. You accelerate, down shift into turn 10 and go flat out to 11. Then it’s up the hill, braking nice and deep into 12. It’s important to carry lots of speed through there and keep it nice and low to get the downforce, then brake late for the last corner. 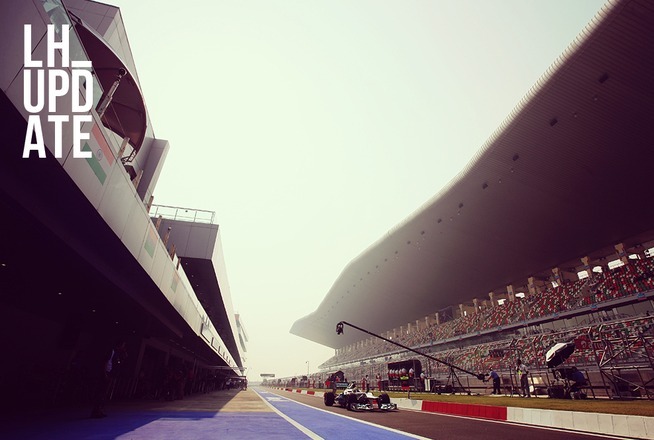 India’s a track where you need good speed on the straight so the downforce level is important. You also need a really good medium and low speed downforce, its a medium/low speed circuit. In terms of overtaking it’s difficult to follow through turn 1, but the exit of turn 2 down the long straight is the best place. Generally the best opportunity is down the straight or possibly into turn 4. It is possible to overtake into the last corner, but it’s very difficult to follow up there. This track isn’t too difficult on the brakes. You can use quite a stiff car here as it’s very small, it’s a new circuit so it is relatively easy to set the car up for it.